I can't imagine how consumers are supposed to trust Equifax now that they've been breached and over 100 million records were exposed. 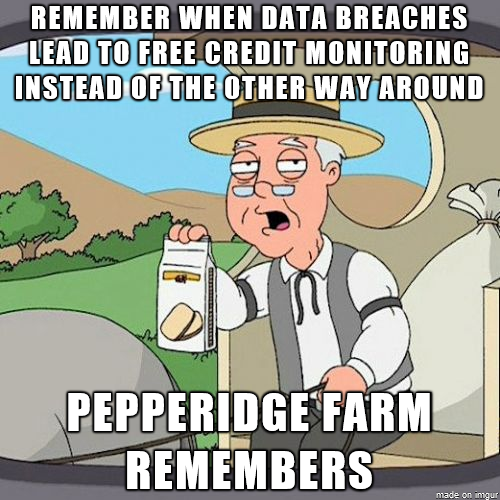 It's a good thing for Equifax that they don't need consumers to trust them, they just need other businesses who get breached to give them their own customers' details in order to offer those customers free credit monitoring in response to their own breach. Ultimately, though, it is the fate of all large databases of valuable information to eventually be breached. We need to rethink what information we compile and hold on to for the long term. Can you patch a plot hole? What are your GPS coordinates today? Is there anyone this doesn't apply to? I'd wait too, wouldn't you? Do you practice safe hex?